We’ve posted about children’s loft bedrooms twice in the past, and each time we’ve noticed those posts have been very popular. The first time we posted loft bedrooms from Tumidei – here, and the second time was bedrooms from GAB – here. As you can see, there were lots of comments on both. It’s probably because of the fun adventurous designs and bold colors that make people wish they had a room like that when they were a kid, but whatever it is, one thing seems to be true…people love loft bedrooms for kids. 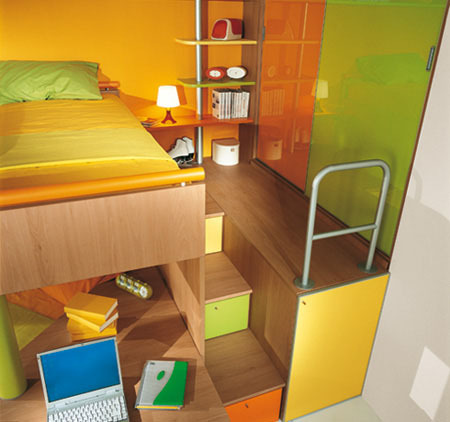 With that in mind, Angelo, a Contemporist reader from Italy, has asked us to make a post about Sangiorgio Mobili, another Italian manufacturer of children’s loft bedrooms. Visit Sangiorgio Mobili’s website – here.